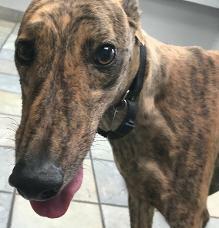 History: Georgy’s dam, CTW Giftofbronze, and sire, Gable Sour Cream have a stellar pedigree on both sides, including some of the most famous Greyhounds (Gable Oscar, Gable Dodge, Wigwam Wag, Greys Statesman, Dutch Bahama, HB’s Commander, Lonesome Cry, Jabberin Jackie, and the Irish Greyhound Fortress). It appears, however, that all of this was not enough to give her the will or ability to be a racer. Instead she’d rather get along on her sweet, playful personality. 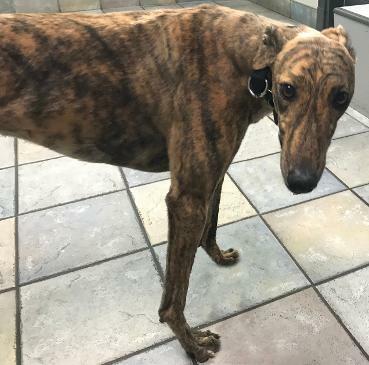 She is a fairly laid back brindle girl that is ready to try out some comfy beds.It appears that Georgy had a broken right rear hock which has now healed. 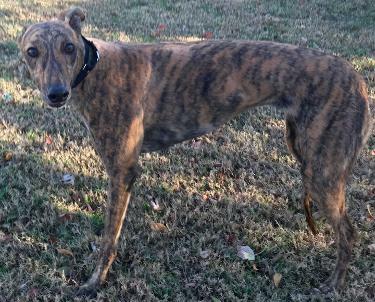 We will know more about her once she settles into a foster home. 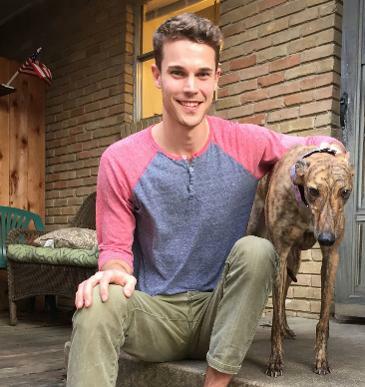 Georgy with her new dad, Nathan! March 24, 2018 update: Georgy found her new forever home. Congrats to Georgy and her new dad, Nathan! 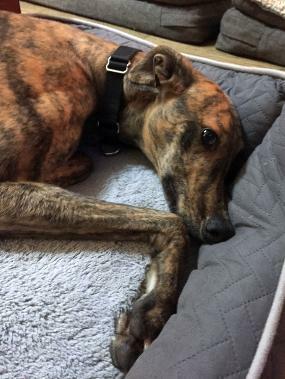 February 15, 2018 update: Georgy spent about a week in a home with other Greyhounds and two cats. Although she was interested in the cats, she was not aggressive towards them. November 20, 2017 update: Gerogy came to TAGS for a life of retirement and to find her loving lifetime home.